The Draggins Rod & Custom Car Show is the longest running club-operated car show in Canada! 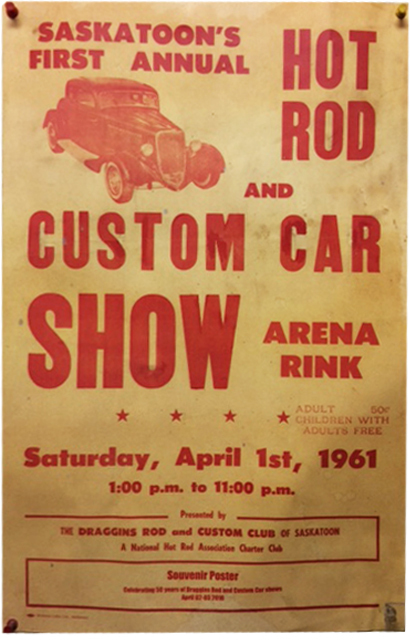 The first show was held in 1961 at the old Saskatoon arena with attendance of approximately 1500 visitors and around 30 cars to view. It has grown to be one of the most loved and anticipated events in Saskatoon. Celebrating their 50th Annual Car Show in 2010, over 300 vehicles were on display and attendance continued to be in the 18,000- 20,000 mark. It is a diversified family show with exhibits from all over Canada and the U.S.A.and is held annually on the Friday and Saturday of Easter weekend at Prairieland Park. The car show is a judged competitive event where exhibitors compete in various classes & years of hot rods, customs, antiques and special interest vehicles in categories such as best paint, best engine compartment, best interior and best engineered. With the support of many community minded businesses & organizations, there is over $10,000 in trophies & cash awards to be won. The show promises to be a highly competitive event offering participants the opportunity to compete with their peers, visitors to enjoy the unique form of family entertainment, & all in the interest of raising money for Camp Easter Seal. The show is packed with hot rods, customs, antiques, muscle, classic vehicles and much, much more. Many faithful fans return every year to watch and cheer at the extremely popular "Battle of the Automotive Technicians" featuring teams of two attempting to assemble a V8 engine in the fastest time. Using the same engine blocks, hand tools, & engine parts, these teams will assemble an engine from parts to running in less than 10 minutes as they compete for their share of over $6000 in trophies, cash & major merchandise prizes provided by our many sponsors. There is always a great deal of activity surrounding the Vendor's booths at the Car Show. If your interests are memorabilia, vintage license plates or books, wonderful art, stationery, new car parts, & much more, be sure to check out the Vendor displays. Car Show activities continue in the parking lot (weather permitting) with the Cool Car Corral where visitors to the show can leave their 'cool cars' for others to look at during their visit to the show.